When archaeologist Charles Warren dug in front of the East Gate in the 1860's, he discovered a heavy masonry wall that formed a courtyard. "The massive wall where first encountered is about 50 feet in front of the Golden Gate. It appears from thence to run to north and gradually turns in to west, apparently following the contour of the ground. ​ This wall is composed of large quarry-dressed blocks of mezzeh, so far similar to the lower course seen in the Sanctuary wall near the Golden Gate, that the roughly-dressed faces of the stones project about 6 inches beyond the marginal drafts, which are very rough. The stones appear to be in courses 2 feet 6 inches in height, and over 5 feet in length. 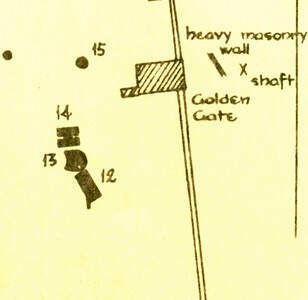 On trying to break through the wall a hole was made 5 feet 6 inches, without any signs of the stones terminating" (Capt. Wilson, Capt. Warren, The Recovery of Jerusalem, 1871, p. 157-158). ​ A similar courtyard wall was later found in front of the gateway at Megiddo and its construction was attributed to King Solomon in the tenth century B.C. The Bible tells of the fortifications built in Jerusalem by Solomon. 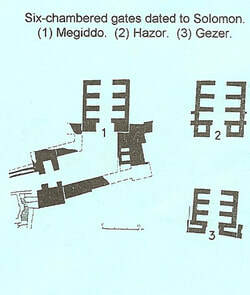 It also mentions his fortification of Hazor, Gezer, and Megiddo (I Kings 9:15). 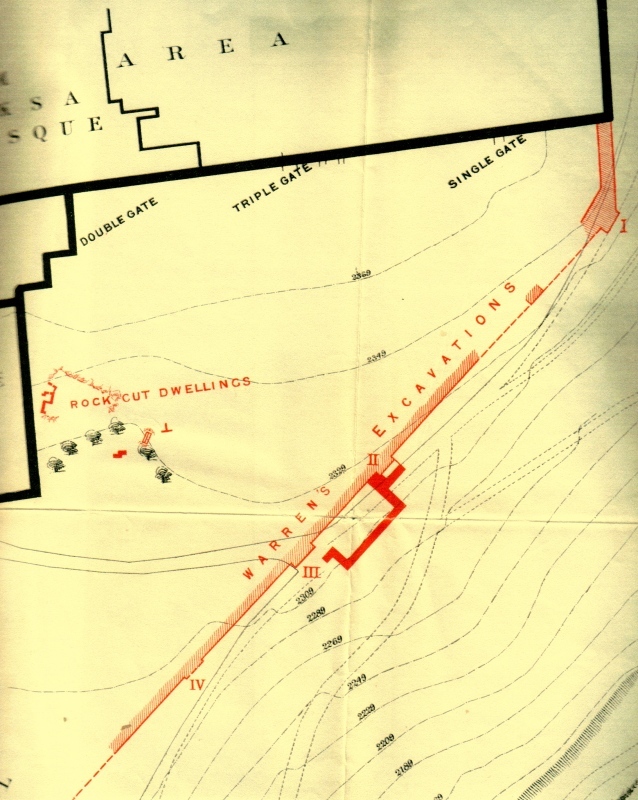 "These three cities have been intensively excavated, and it is only to be expected that they should yield remains of Solomonic fortifications. The Six-chambered gateway thus has its origins in the days of Solomon, at about the middle of the tenth century, and it seems that the gates of Hazor, Gezer, and perhaps also Megiddo can be attributed to the architects of that king" (Gabriel Barkay, The Archaeology of Ancient Israel, 1992, The Iron Age II-III, pp. 307, 308). "Letter of October 2nd, 1868. - At 312 feet from the bend we have found at the plinth level the top of a tower projecting 16 feet beyond tower. The stones of a large description, having a marginal draft or bevel; the face within the draft being rough hewn similar to some in the Haran Wall. The stones of this extra tower are from 2 to 3 feet in height, and 4 to 8 feet long; the face of the tower is 26 feet. It has been examined to a depth of 25 feet below the rock foundation of the Ophel wall and it is of one description throughout" (Captain Charles Warren, The Recovery of Jerusalem, 1871, pp. 293, 294). This tower was re-excavated by Dame Kathleen Kenyon in the 1960's (her Area S-II) and she described the stones used in its construction as being "of the character identified as Phoenician at Samaria, with irregularly projecting bosses having unequal margins on one, two, or three sides. Solomon's use of Phoenician masons is undoubted" (Kathleen Kenyon, Digging Up Jerusalem, 1974, p. 115). "The Golden Gate’s outer façade is composed of two blocked-up gateways adorned with intricately carved relief arches. 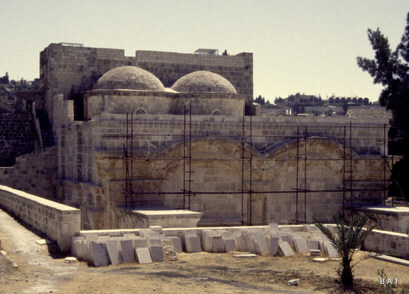 The decoration of the arches to the front and back of the gate are identical to the applied arches of the Double Gate which date from the Early Islamic period. The gate appears therefore to have been rebuilt in the Umayyad period, on the foundations of an earlier gate. The remains of two massive monolithic gateposts are preserved inside this gate. ​ The gateposts are set in the same line as the Eastern Wall of the Temple Mount and line up with the massive masonry that can be seen on either side of the Golden Gate. The gateposts and the two masonry sections appear therefore to be part of the same construction. ...The two gateposts belong to a gate that dates from the First Temple period and is most likely the Shushan Gate, mentioned in Mishnah Middot 1.3 as the only gate in the Eastern Wall. The gate most probably was given this name by builders who had returned from exile in Babylon and for whom the Palace of Shushan lived on in their memories. However, if so, there would have been a tradition of an eastern gate in this location from the time of the construction of the original Eastern Wall. 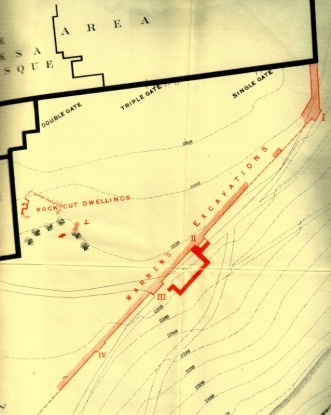 It seems reasonable to suggest that the central section of the Eastern Wall Dates from the First Temple Period" (https://www.ritmeyer.com/2019/03/11/the-golden-gate-of-the-temple-mount-in-jerusalem/). ​ And Hiram king of Tyre sent his servants unto Solomon; for he had heard that they had anointed him king in the room of his father: for Hiram was ever a lover of David. ...And the king commanded, and they brought great stones, costly stones, and hewed stones, to lay the foundation of the house. And Solomon's builders and Hiram's builders did hew them, and the stonesquarers: so they prepared timber and stones to build the house (I Kings 5:1,17,18). I Kings 9:15 says, "And this is the reason of the levy which King Solomon raised; for to build the house of the Lord, and his own house, and Millo, and the wall of Jerusalem, and Hazor, and Megiddo, and Gezer." Is it possible that Solomon had his builders construct a six-chambered gateway in the wall at Jerusalem, just as he may have done at Megiddo, Hazor, and Gezer? Then came he unto the gate which looketh toward the east, and went up the stairs thereof, and measured the threshold of the gate, which was one reed broad; and the other threshold of the gate, which was one reed broad. And every little chamber was one reed long, and one reed broad; and between the little chambers were five cubits; and the threshold of the gate by the porch of the gate within was one reed. He measured also the porch of the gate within, one reed. Then measured he the porch of the gate, eight cubits; and the posts thereof, two cubits; and the porch of the gate was inward. And the little chambers of the gate eastward were three on this side, and three on that side; they three were of one measure: and the posts had one measure on this side and on that side (Ezekiel 40:6-10). Although Ezekiel is here describing the Millennial Temple, walls and gates, the vision is patterned after God’s instructions (I Kings 6:11, 12; I Chron. 28:11-21) given to David and Solomon for the literal building of the First Temple complex of which Ezekiel and all the people of Jerusalem had intimate knowledge. Both were inspired by the same Divine Designer: Then David gave to Solomon the pattern... And the pattern of all that he had by the spirit... (I Chronicles 28:11, 12). All this, said David, the Lord made me understand in writing by his hand upon me, even all the works of this pattern (I Chronicles 28:19). While visiting the Temple Mount in 1984, I took a picture of the back side of the East Gate of the Temple Mount (see below). While examining the picture, my brother, Bill, noticed the scaffolding that had been set up during reconstruction of the gate and he suggested that we compare the standard measurements of scaffolding with the width of the current guardhouse. This allowed us to get an approximate measurement of the width of the existing structure - 48 feet - the same width as Solomon’s six-chambered gate in Megiddo. 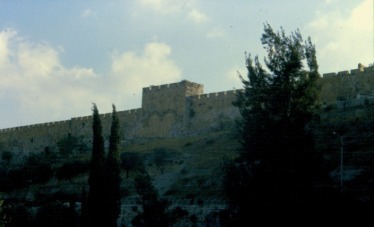 To prevent the enemy from conducting a direct assault, Solomon's builders constructed a wall in front of the East Gate, similar to the one at Megiddo. The wall formed a courtyard in front of the gate and changed the direction of entrance ninety degrees. Just to the south, the Ophel Gate (Horse Gate) also has a wall in front of it (attached to the tower and constructed with Phonecian ashlars). Because of the topography, the courtyards varied in shape; however, the area of each is about the same. The Ophel Gate and East Gate courtyard walls were both discovered in 1867 by the eminent British archaeologist, Captain Charles Warren. The ashlars (laid in the header and stretcher style) are Phoenician in character and in each case, date to the time of King Solomon. ​In light of I Kings 9:15, and the archaeological discoveries to the east and south of the Temple mount, I believe that there is enough evidence to conclude that remnants of a six-chambered gate, dating to the time of Solomon, currently exists beneath Jerusalem's magnificent Golden Gate. This guardhouse may be built directly over the site of the original Eastern Gate of the First Temple Period. This magnificent courtyard wall, found by Warren, had a tower connected to it's northern end. This tower incorporated huge Phoenician ashlars in its construction and is dated to the time of King Solomon. The four-chambered gate and city wall here have been shown to be older than this tower and, therefore, may have been constructed by Solomon's father, David.